I told you I'd blog about how to make a FBCT (frozen buttercream transfer) if mine didn't fall apart. HERE is a great tutorial on how to make a Frozen Buttercream Transfer. I first made a FBCT for my daughter's second birthday. 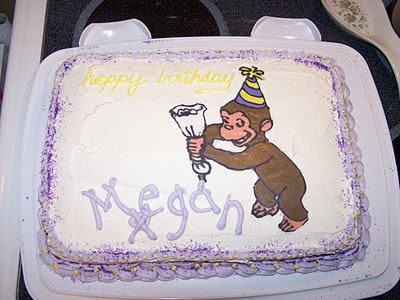 It wasn't that difficult - just time consuming - and I thought Curious George turned out cute! I began digging through my little guy's car collection, trying to find his dump truck and backhoe with the intention of scraping off all the frosting, starting again, and placing some cars and trucks on top. 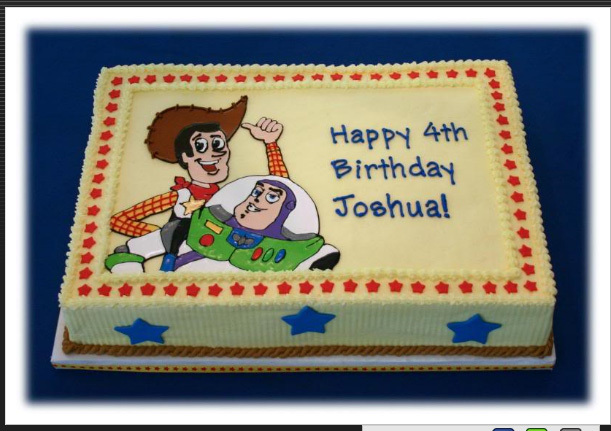 Before I could scrape that frosting off, my little guy came into the kitchen saw my HORRIFIC Buzz and Woody...and you know what he said? "Mommy! I WUV my cake!" So, that was that. I ended up keeping most of the wax paper on the FBCT/cake just to preserve the image as much as I could. Congratulations to Charity (comment #67) on WINNING the beat-the-winter-blues $65 gift certificate to CSN Stores! As for me, we are in the midst of a snowstorm. I'm actually keeping my mind off the gray sky and swirling snow by making a batch of Birthday Buttercream! My little guy is having another birthday and I'm getting a start on his cake with a FBCT (frozen buttercream transfer). Want to know how to make one too? Well, I've taken lots of pictures and once the whole cake is decorated (and as long as the FBCT doesn't fall apart), I'll be blogging to show you how!